Back up your keys offline before you sign up for the new wallet.steemit more than just as a precaution. For anyone who is following or doing the transition to the new wallet.steemithere are a few tips to avoid disaster. The new wallet now has a new url steemitwallet.comeither url will work. We should always backup our steemit keys but we are humans and we can and do make mistakes. (1) Remember nobody not even steemit can recover your keys so it is your responsibility to make sure you can recover your account should the worst happen. (2) Make a backup of your private keys in an editable format so that you can copy and paste them when you sign back in to steemit. The reason for this is simple. The keys are long and complex and easy to make a mistake when typing them out. Mistakes happen. (3) Keep a copy offline in a thumb drive of even print them off if you have no other way to store them securely offline. Do not use your owner or active keys on any platform including steemit or any of the dApps just use your posting keys. The active key should only be used for transfers. A few days ago I signed up for the wallet.steem and then things got pretty weird. I am going to admit that I think it may have been user error on my part prompted by insufficient information on implementing this seemingly straightforward changeover. It was very odd, frustrating and puzzling. When I signed into wallet.steemit it appears that google chrome overwrote my steemit login with the new wallet.steemit key? My own actions had locked myself out of my steemit account? Remember to save your new wallet login with a different name otherwise the browser will overwrite your steemit login of the same name! When I checked the steemit posting key in the password manager of Google chrome it was the same as the wallet.steemit owner key. 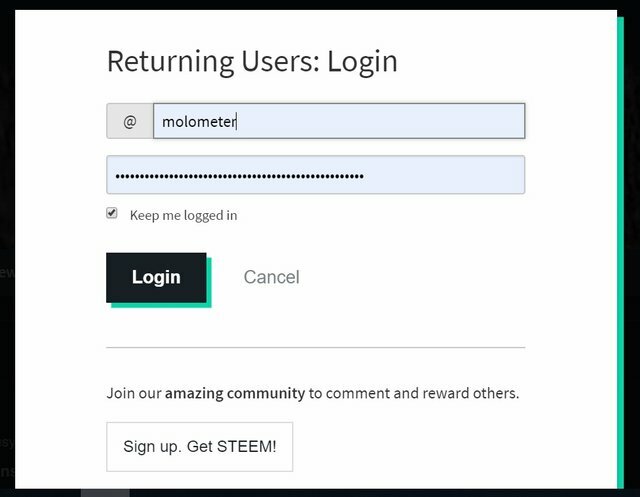 When I signed up to the new wallet and then went to login to steemit under my username @molometer somehow, I didn’t notice that the key from the new wallet had replaced my steemit password and when it was selected of course, it would not allow me to login to steemit.com It took me a bit of time to figure out what had happened. I spent the next few hours trying to figure out what was going on and even posted this blog to see if anyone else in the steem community was having similar issues. I then went back to first principals. I retraced my steps and when I checked the passwords in Google chrome and sure enough it had been swapped. Not by any dodgy business by bad actors but by my own user error. The weird thing was that I was still able to use other steem based dApps like busy.org and steempeak with no problem and wrote a post about what was happening to see if anyone else was having this same problem. I even dropped a comment into @andrarchy's comment about the wallet. Sorry Andrew if it gave you any cause for concern. It eventually dawned on me that it was possible to use the other dApps because they all use either steemconnect or keychain which has our original posting keys in their systems. Finally, after spending 3 hours hunting for my steemit keys in my safe offline storage I got back into my account and that was a relief but it kept allowing me to sign in and then promptly dropping me back out again. The solution was simple. Just hit the little keep me logged in button under your username on the login page. For someone like me with a background in the computer industry for over thirty years. Embarrassingly It was a rookie mistake. The point being. If this can happen to me; It can happen to anyone? Create a new user name for your wallet and avoid this problem. The move to a separate wallet off of steemit is the right thing to do in my opinion. Even better if we could off-site our powered up steem (vests) into an offline wallet but still have the voting power. The vests would still be staking but would mean either having to leave the computer/phone on 24/7 or having to synch every time we logged in. Which could take a lot of time. Having the keys means we have ownership of our steem but nothing is 100% secure. Be safe. Yeah the other day my friend could not get into the usual Steemit wallet after having been in it earlier in the day. Very hard and frustrating to troubleshoot via texts! Hope it is all sorted soon. Good advice here! Hi Paul, yep it was very frustrating but I got it sorted out in the end. I'm pretty sure many steemians are going to run into this problem if they don't chose another name for the new wallet. The wallet password will overwrite the original steemit password stored in the browser because it's the same username! Well is it something that Steemit can fix or is it mainly browser related? Now I am scared to fool with the wallet. Just found this comment. Sorry about the delay. No steemit cannot fix it. It client side. 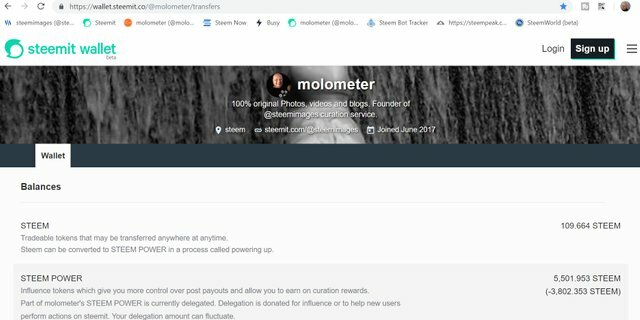 Thanks @molometer, this is the first I have heard of wallet.steemit. When I first joined Steem I was a bit apprehensive I’m used to accessing crypto with a Ledger nano s. So wallet. Steem might be a good step forward. Let us all know how comfortable you are with this wallet going forward in some post. If I understand correctly this only works for undelegated Steem, just liquid steem??? When you save the login name from the new wallet make sure to give it a new name otherwise you may run into the same issue that I had. The wallet has it's own key which can easily be swapped by 'accident'. That I think is what I went through, now I know, but does this mean that I can not get to the wallet.steemit, because I do not have a wallet.steemit key? (I did not think there would be different keys on the wallet.steemit to save and I do not recall seeing any prompts to save new keys ). It all seems to be working for me now. I even powered up and converted some SBD to steem to make sure everything still worked right. Hi @bashadow, no the keys are the same but if you login to wallet.steemit you will see that your owner and active keys are hidden and the wallet generated a new key that somehow got swapped with my posting key. If you try to view your owner or active keys in the wallet it will ask you to enter your active key which it doesn't accept and just times out. I assume that when it is fully implemented these functions will work? I just did a test power up too and it is working. Glad to hear that I did not miss something about new keys then. 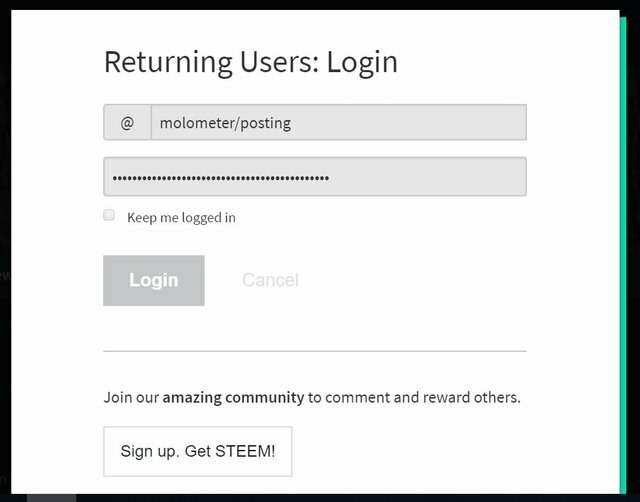 It took me a long time to figure out how to get re-signed in, The login button would not work, I had to right click open in new window to get to a steemit login page, then the user name long box and password box, and then the login button would never highlight,I finally clicked on the steemit logo in the upper left and found the login screen for returning users under it. Just glad all is back to normal. Yep, it was a bit of a nightmare trying to get signed into again as you experienced. Everyone really needs to have a backup plan in place just for these kinds of issues. I do think the setup on steem is very good if you follow the guidelines about security and in the end this is what the whole new wallet system is hoping to solve. It's one less attack vector to worry about. I do like and appreciate the simplicity of steemit, I now have a busy.org folder, and a steeve folder for the justincase issues, steemitstage I guess is no longer an option for backup like it used to be for me. edit:I guess I should have checked my back-up site every now and then to make sure it was still there. I should have checked my back-up site every now and then to make sure it was still there. Thanks for resteeming Melinda, the more people that know about this the better. I haven’t tried the new wallets yet as I have been considering to change my passwords as part of the process for an additional layer. I think it help for more to give this visibility given the potential challenges! Just in case the old keys were used in the past in error. I upvoted your contribution because to my mind your post is at least 6 SBD worth and should receive 144 votes. It's now up to the lovely Steemit community to make this come true. Howdy sir molometer! this is a very useful and educational and informational post, thanks for this and I'm resteeming it also. |Great job on this. Thank you @janton, the more people that take notice and get their keys stored offline the better. If you don't have the keys you don't own the steem. Howdy tonight molometer! That's a scary thought, it you don't have the keys you don't own the steem! Thanks for the warning! Good information @molometer. I have my key in a couple of places just in case. Good idea to have a couple of backups offline. You never know when they may be needed? Good to know, Michael! I memorized my ## because the old man was so adamant about not keeping myself logged in! 🎁 Hi @molometer! You have received 0.1 SBD tip from @dswigle! So we need to use the new steemit wallet? Yes it will be the defacto wallet very soon.